Many seem bewildered by the anti-Trump riots and demonstrations. And many keep trying to find a reasonable response. Give it up. You can't reason with them with words. Here is my take. They know full well that they aren't going to overturn the election. These privately funded forces are being used to create pressure to destroy the Electoral College so they won't have to deal with it next election. This is how the Left operates. Make a big deal over here to force the hidden agenda over there. The plan is to make enough trouble that Congress will move to abolish the EC to get some peace. For clues on who is behind this effort one only has to watch to see which member of Congress proposes such action. The answer of course is California Senator Barbara Boxer. It only took a week after the election for her to come to the rescue of the broken and distraught Left. Meanwhile, hidden forces are now meeting with and brow beating members of the Electoral College to get them to change their vote from the true winner of their state and vote out Trump. The danger is real and gaining ground. But it didn’t start with this election result. A campaign to eliminate the Electoral College and “let the people elect the president,” has been gaining steam for several years. A group called “National Popular Vote Interstate Compact,” http://www.nationalpopularvote.com/ started in 2006, has won commitments from eleven states to award their electoral votes to the winner of the popular vote. These include, Maryland, New Jersey, Illinois, Rhode Island, Vermont, Washington, Massachusetts, California, New York, Hawaii and the District of Columbia. These states control 165 electoral votes. They only need states representing 105 more electoral votes to join and the Electoral College will be a thing of the past. Meanwhile, such legislation is under consideration in Missouri, Oklahoma and Arizona, to name a few. When a state passes legislation to join the National Popular Vote Interstate Compact, it pledges that all of that state’s electoral votes will be given to whichever presidential candidate wins the popular vote nationwide. These bills will take effect only when states with a majority of the electoral votes have passed similar legislation. States with electoral votes totaling 270 of the 538 electoral votes would have to pass NPV bills before the compact kicks in and any state’s bill could take effect. As usual, it’s easy to get people to join this cause – yet another sound bite based on emotion rather than knowledge or logic. “Let the people decide.” “It’s the American way.” “It’s Democracy at work.” Yep, that’s why America was never set up as a democracy. Here’s another sound bite for you – “Democracy is a lynch mob.” Here’s another one – “Democracy is three wolves and a sheep voting on what to have for lunch.” Majority rule violates the rights of minorities. It’s not a good thing. Get the picture? The United States was created by the individual sovereign states. They were already free and independent governments on their own. As they came together to create a central government they feared it would grow too strong and overpower the states, making them subjugated to the central government. So, to prevent that, the states created the Electoral College to make the election of the President a STATE election. Throughout history, certain factions have challenged the legality of the Electoral College. Opponents point out that our President is actually elected by 538 virtually unknown people who are members of 51 small delegations in fifty States and the District of Columbia. Moreover, in most states the electors are not even bound to vote for the candidate that won the popular vote. In fact, many Constitutional scholars believe that’s just what the founders intended, 538 independent thinkers, bound to no one. There is reason and logic behind the idea. The Founding Fathers, particularly those from small States, were very concerned that they would be smothered by the larger states. Under the representative republic (not a democracy) established by the founders, the United States is made up of fifty sovereign States. Under the Constitution, except for limited powers specifically defined for the central government, power for the rule of law is intended to reside in the States. To deal with the problem, the founders decided on a compromise that would establish two chambers for the Congress; the House of Representatives, whose size would be dictated by the population in each state and the Senate in which every state would get two representatives, regardless of its size or population. You see, in the beginning, the states appointed Senators to be their representatives in Congress. But, like these so-called scholars of today who want to wreck the Electoral College, previous “experts” came up with the idea that Senators should be elected by the people – “It’s only fair,” went the mantra! The result is an imperial Senate that answers to no one but their own elite club members. That’s what happens when you mess with the real genius of the Constitution. Tom DeWeese, president of the American Policy Center, is one of the nation’s leading experts on Agenda 21 and its assault on property rights and personal freedom. He is author of the book “Now Tell Me I Was Wrong” and editor of the monthly newsletter The DeWeese Report. For more information visit www.americanpolicy.org. Submitted by email_registrat... on Sun, 11/27/2016 - 23:49. 'One person, one vote' is the greatest rationale for removing or re-tuning the Electoral College. - Should one voter's vote in one state 'count' less than the vote of someone in another state? Many of us find it hard to dismiss this argument. Our Founders did a GREAT job devising the details of our republic. But let's not ignore the fact that they debated and disagreed -- and compromised extensively -- in order to devise a framework that the leaders of the 13 colonies agreed was good enough. 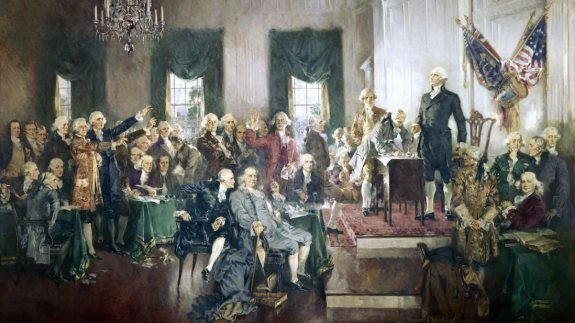 - Our republic was devised -- particularly with the Bill of Rights and subsequent Constitutional Amendments -- to protect the rights of minorities, and to protect against a tyranny of the masses. Good work! - Our republic and our Constitution were devised with specific provisions to amend the Constitution and our governance, as necessary. Again, good work! It is unreasonable, however, to expect that our founders could anticipate the changes from the world they knew -- which was largely rural; citizens had only limited access to information or even communication tools; and great portions of our uneducated populace were illiterate and were engaged in agricultural or menial roles. Mr. DeWeese argues against the change that allows each State to elect its Senators, claiming "The result is an imperial Senate that answers to no one but their own elite club members." I maintain, by contrast, that a closed system where each state appoints its U.S. Senators is more likely to result in Senators who answer to elite club members [the club being the small group who appointed them]. I believe it's time to recognize the changes in our country and our populace since the founding days, and retire the Electoral College as an artifact of its time. - Unlike the late 1700s, we have mandatory public education, providing skills that would allow our citizens to make more-informed voting decisions. - Science, technology, and our communication systems provide citizens the ability to vote from the most-remote sections of the world and have their votes counted in a reasonable timeframe. And minority rights are protected in other amendments enacted in the Constitution, and through the checks and balances in the design of the founders. Stop the Clinton Crime Cabal! Submitted by allanroycaptainf on Tue, 11/22/2016 - 16:57. Both Klintons need to be Run out of this Nation! If they manage to overturn this election the streets will run red with the blood of liberal crybaby weenies! Submitted by email_registrat... on Tue, 11/22/2016 - 14:33. I don't see the problem with the riots, let the liberal dem bloodsuckers riot and burn all they want to, they can do it day in and day out for the next 20 years, as long as they do it in the dem controlled large cities, burn them down to the ground. If they come out into the real world with that garbage we will hunt them down like rabid dogs. Submitted by simonjester on Tue, 11/22/2016 - 01:03. The 17th Amendment should be repealed. Submitted by allanroycaptainf on Tue, 11/22/2016 - 16:59. The Clinton Crime Cabal needs to be run out of the U.S.